0ur company invested 10 million RMB in two cold drawing lines, one is 200 tons and the other is 320 tons with acid cleaning, phosphatization , heat treatment and alignment cutting. 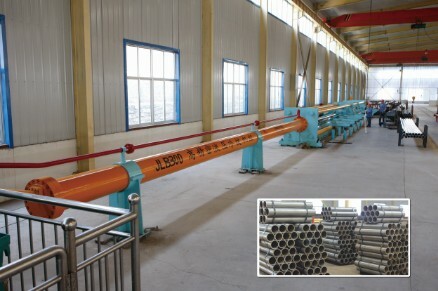 These two lines can process various seamless tubes range from diameter 40mm to 400 mm. They can improve our production efficiency and can supply cold drawn tubes to other machinery companies. LB Series Chain Gold Drawing Machine can be made into a chain machine set according to customer's requirements. The pull of this machine set ranges from 5T to 300T,and it's drawing length can reach 200 meters. It is widely applied to draw copper, aluminium, steel and other materials, expecially low-cost and extra-long pipe products. It's advantage lies in precision of cold drawing, adjustable speed, automatic charging and blanking, and optional online cutting and automatic length-fixed cutting.